Proof of Humans and Dinosaurs Together!? - Ancient Explorers Proof of Humans and Dinosaurs Together!? Here is a mystery nobody wants to touch. 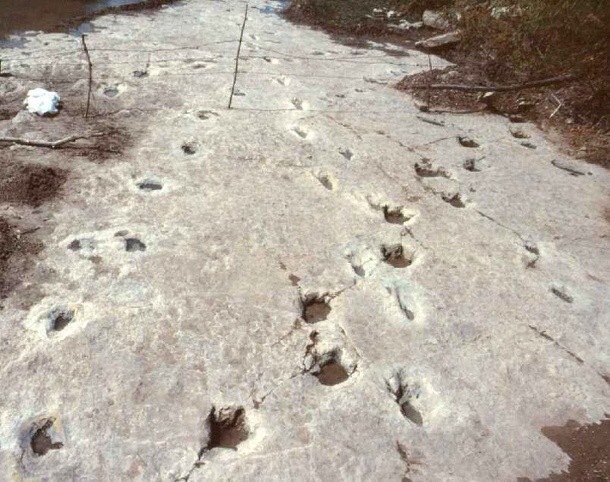 In a riverbed in Paluxy, Texas, archaeologists have found both dinosaur tracks and human footprints together. Both made at the same time. And, not just one track, but dozens. All the tracks are the same age, about 140 million years old, and they were made together. From the spacing of the footprints it is clear the ancient person was clearly tracking the dinosaur. 35 Several scientists have said it is not possible; however, those that say this have never gone to visit the prints themselves. In 1983 a report appeared in the ‘Moscow News.’ The article reported that human footprints that were 150 million years old were found in Jurassic rock next to a dinosaur footprint that had three toes. Other fossils were found in 1968 in Utah. There were human footprints found there as well, and these footprints are 440 million years old! Not only that, but the feet had shoes on them! One of the footprints has an ancient marine animal called a trilobite squashed under it. The shoe print with the trilobite in it is in perfect condition. Dinosaurs are often portrayed as having lived in a time before man. However, the available evidence shows that man and dinosaur coexisted..